Regarding our new IEG open access publication “On site, in time” here is Thomas Weller’s article on Nantes, in which he focuses on the issues of religious freedom and slavery. On April 13th, 1598 in the city of Nantes, King Henry IV of France signed a document ending a series of religious wars that had devastated the country and brought the French monarchy to the point of ruin. In the form of Calvinism, Protestantism had been attracting increasing numbers of followers in France by the mid-16th century. These Huguenots, as they were called, were persecuted by the Catholic Church and the French Crown. Intensified by a dynastic crisis after the death of King Henry II (1559) the conflict escalated to a veritable civil war. One of the bloody climaxes of this more than 30-year struggle was the so-called St. Bartholomew’s Day Massacre (1572), in which between 3,000 and 4,000 Protestants died in Paris alone. When Henry of Navarre, the Huguenot military leader, succeeded the murdered Henry III to the throne, the conflict appeared again to worsen. Only after the new king converted to Catholicism in 1593 and was accepted by the Catholics was the path open to a peaceful solution to the conflict. Five years later, Henry IV guaranteed his erstwhile fellow Protestants a series of privileges that henceforth would ensure a non-violent coexistence for the two Christian confessions under the protection of the Crown. With the Edict of Nantes, which in large part resembled earlier so-called pacification edicts, France’s confessional division was reinforced. The ideal of religious unity in the commonwealth was sacrificed in the name of political unity. Although the document was in fact the result of negotiations between the warring parties, it took the form of a royal amnesty. 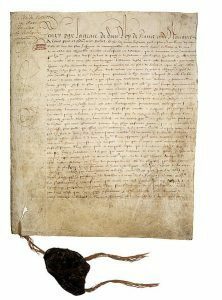 Thus the Edict’s legal form made it in principle revocable, even though its text called it “perpetual” and “irrevocable”. On this basis, it was possible to pacify the violent conflict for nearly 100 years and establish rules for the coexistence of Catholics and Protestants that were accepted by both sides. The Edict guaranteed Protestants freedom of conscience and limited freedom of worship as well as protection from persecution, but it did not give them equality with Catholics. Thus adherents to the Roman Catholic Church, whose faith was declared the national religion, continued to enjoy free practice of worship all over France. Furthermore, all of the ecclesiastical property was returned to them that had been taken by Protestants during the religious wars. The Protestants, in contrast, were only permitted to worship in specific locations established by the Edict. Protestant services were explicitly forbidden at the royal court and in Paris and its environs, in all royal castles and episcopal seats, and in the army. Of essential importance for the peaceful coexistence of the two religious communities was the guarantee of civil and political rights for the Protestant minority. Huguenots were guaranteed access to all royal offices and functions as well as to all other non-ecclesiastical bodies and honorary posts. They were also given the right to reside in any part of France and to freely choose their occupation. The tone was also set by regulations concerning the relationship between Protestant religious communities and the French state. Protestants were allowed to administer their own churches and autonomously regulate the affairs of their own faith. The Crown contributed financially to the maintenance of Protestant pastors and educational institutions. In return, however, Protestants were required to pay Catholic tithes. In addition, the Edict contained a series of political and military protections that, however, did not last long. Louis XIII revoked them in the 1629 Edict of Alès after the resurgence of fighting in southern France. In the mid-17th century the Crown continued to restrict the rights guaranteed in the Edict of Nantes, and in 1685 Louis XIV finally revoked the remaining privileges with the Edict of Fontainebleau. This drove around 200,000 Huguenots into exile. Only with the French Revolution of 1789 would French Protestants get their full civil rights back and achieve, for the first time, unrestricted freedom of conscience and worship. Although the religious provisions proclaimed at Nantes in 1598 did not endure permanently, they provided a model throughout Europe for the pacification of religious struggles by means of the state-guaranteed protection of minorities. In the aftermath, other rulers issued similar toleration edicts. Here we see the beginnings of the separation of politics and religion and of the state’s neutrality with regard to individual beliefs. France continues to be the best example for both of these principles: in 1905 – under different historical circumstances – the strict separation of church and state was written into law, and it endures today. Nantes, located at the mouth of the Loire became the most important port for the French slave trade in the 18th century. This lucrative business yielded rich profits for European merchants. It was paid for by more than 11 million Africans with life-long forced labor or early death. The multi-week ocean crossing alone, in which slaves were packed in tightly as human cargo in the hull of a slave ship, was the death of many. Although French merchants only began to participate in the ferocious business on a grand scale in the early 18th century, they were responsible for about 13 per cent of the entire Atlantic slave trade. France was thus the third-largest slave-trading nation in Europe after Portugal and Great Britain. Around 40 per cent of all French slave ships sailed from Nantes. According to estimates, more than 1,700 ships sailed from this port alone, transporting about 450,000 African slaves to America in the 18th century. The enormous profits gained from the “traite négrière” can still be seen today in the houses of rich slave traders on the Quai de la Fosse, from which the slave ships cast off. 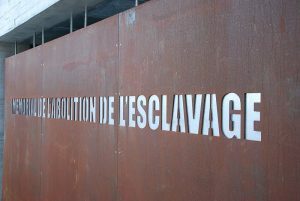 In March, 2012, a monument to the memory of the abolition of slavery (Mémorial de l’abolition de l’esclavage) was set up there. Inside the monument, texts and images evoke the difficult attempt – and not only on the part of the French – to deal with one of the darkest chapters in European colonial history. Until the 18th century, the fact that not all human beings enjoyed individual liberty was not per se worthy of criticism. Ever since antiquity, forms of serfdom and slavery had been spread across Europe, too. However, the mass enslavement and exploitation of Africans by Europeans, which began with European expansion in the late 15th century and reached an initial high water mark in the 18th century with the boom of the Caribbean plantation economy, was of a different character – and not only in view of the numbers involved. Despite sundry criticisms expressed especially by missionaries, most Europeans became convinced that Africans were an inferior race and thus could be treated like cattle and bought and sold like objects. This dehumanization of a portion of humanity on account of ethnic attributes laid the basic foundation for the rise of modern racism. As criticism of the hierarchical social structures of the Ancien Régime grew leading up to the French Revolution, the practice of slavery in the French colonies also began to be seriously questioned. In contrast to Great Britain, where it was mostly religious groups who militated against the Atlantic slave trade and protest quickly snowballed into a mass political movement, the criticism of slavery in France was more secular in nature and remained within small groups of the political and intellectual elite. Nevertheless, one of the champions and members of the “Societé des Amis des Noirs”, founded on the British model in 1788, was a French clergyman, the Catholic priest and future revolutionary Abbé Grégoire. Most representatives of the French Enlightenment, however, were ambivalent about the Atlantic slave trade. Voltaire, for example, criticized slavery in some of his writings, but he also assumed, like many other Europeans, that Africans were inferior, and he had no compunction toward investing a portion of his wealth in the French West India Company. When a rich merchant from Nantes named a slave ship after him in 1768, the enlightened philosopher considered it an honour. Around twenty years later, the French Revolution propagated the freedom and equality of all Frenchmen – but not of slaves – in the Declaration of the Rights of Man and of the Citizen. Only after a slave revolt broke out on Saint Domingue (modern Haiti) did the National Assembly also decree the abolition of slavery in 1794. Only eight years later, however, it was reintroduced. Under diplomatic pressure from Great Britain, France abolished the slave trade in 1815. Yet powerful economic interests prevented the abolition of slavery in the French colonies. Only in 1848, after a new revolution gave France another republican constitution, was a general ban on slavery in all French territories issued. It would endure beyond the Second Republic (1848–1852). This important date, however, represented only a stage win in the overcoming of inequality between Europeans and the inhabitants of other parts of the world. Clearly, the legal and above all the social discrimination against human beings on account of their skin colour or origin has long outlasted the abolition of slavery. Just how explosive this topic still is can be seen, once again, in the example of France, which has long had a hard time coming to terms with its colonial history. In 2001, after intense debate, a law officially declared slave trading a violation of human rights and required that the subject be integrated into school curricula. The social debate did not end there, though, but rather continues today. Eckhart Birnstiel, Edikt von Nantes, in: Enzyklopädie der Neuzeit, vol. 3, Stuttgart 2006, coll. 26–30. Janine Garrisson, L’Édit de Nantes. Chronique d’une paix attendue, Paris 1998. Janine Garrisson, Denn so gefällt es uns. Geschichte einer Intoleranz, Bad Karlshafen 1995. Mack P. Holt, The French Wars of Religion, 1562–1629, Cambridge 2nd ed. 2005. Ulrich Niggemann, Hugenotten, Cologne et al. 2011. Olivier Pétré-Grenouilleau, Nantes au temps de la traite des noirs, Paris 1998. Christopher Miller, The French Atlantic Triangle. Literature and Culture of the Slave Trade, Durham, NC 2008. Sue Peabody, There Are No Slaves in France. The Political Culture of Race and Slavery in the Ancien Régime, New York 1996. Jochen Meissner et al., Schwarzes Amerika. Eine Geschichte der Sklaverei, Munich 2008. Birgitta Bader-Zaar, Abolitionism in the Atlantic World: The Organization and Interaction of Anti-Slavery Movements in the Eighteenth and Nineteenth Centuries, in: European History Online (EGO), published by the Institute of European History (IEG), Mainz 2011-12-09. URL: http://www.ieg-ego.eu/baderzaarb-2010-en URN: nbn:de:0159-2011120524 (28.10.2016). ↑Ernst Mengin (ed. ), Das Edikt von Nantes. Das Edikt von Fontainebleau, Flensburg 1963, p. 23. Thomas Weller, Nantes, in: On site, in time. Negotiating differences in Europe, ed. for the Leibniz Institute of European History (IEG) by Joachim Berger, Irene Dingel and Johannes Paulmann, Mainz 2016. URL: http://en.www.ieg-differences.eu/on-site-in-time/thomas-weller-nantes, URN: urn:nbn:de:0159-20161103296. This entry was posted in Actualités / News, Articles and tagged Abolition, Religious Freedom, Slavery by Fabian Klose. Bookmark the permalink.